Post conference proceedings SCCG 2011 is to be published by ACM Publishing House. organize the SPRING CONFERENCE ON COMPUTER GRAPHICS 2011. 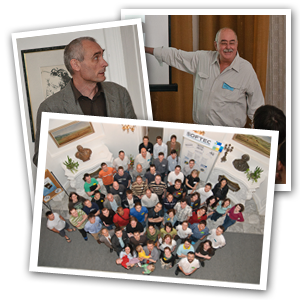 The conference is held in the hotel Galbov mlyn, Vinicne (about 80 km near Vienna) on April 28-30, 2011. This event is the oldes regular annual meeting of CG community in Central Europe. The spring conference attempts to cover interesting projects from computer graphics and image processing and their applications. The philosophy of SCCG is to put together top experts with young researchers and to support a good communication channel for East-West exchange of prospective ideas. Young researchers are esp. encouraged to submit their work. The conference language is English. In the case of interest, please, complete the registration form at SCCG homepage. We ask the authors to check the typographical quality (size of fonts, illustrations…) with respect to the formatting guidelines that can be found on SCCG page. The conference proceedings of papers passed through review is to be published before the event by Comenius University and by ACM SIGGRAPH afterwards. There is also a possibility to submit posters or company profiles (reviewed by the organizing committee) to be presented at the conference exhibition and printed in the second part of the proceedings with ISSN 1335-5694. Additional information will be sent to registered participants later. The hot information can be found on SCCG homepage.